- with 71cm hollow ground triangular formed blade engraved with gold lined floral motifs and marked ‘IGB' at the ricasso, cast chased and guided hilt with down turned quillion in the form of a medusa head, the shell guard with a winged angel with long horn, knuckle guard interrupted with lion's head mask, the grip scales chequered and inlaid with a brass monogrammed devise marked ‘MS' and pommel if the form of a visored helmet. 87cm overall. 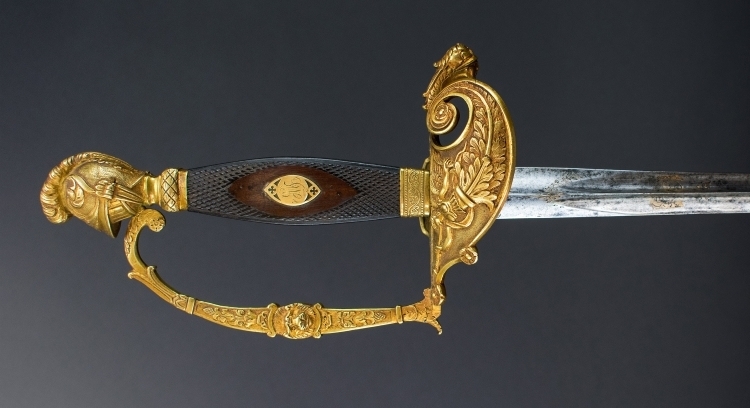 Very good original condition with much gilding and the blade without corrosion.